When the Iowa Department of Transportation (DOT) designs a highway, the agency uses many tools to ensure the highway will meet users’ needs. 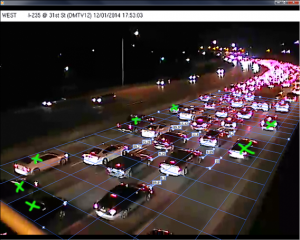 A recent study at Iowa State University’s Center for Transportation Research and Education (CTRE) will help designers get the most out of one tool—the traffic microsimulation software Vissim. Vissim can help design engineers optimize traffic flow when designing urban freeway interchanges across the state. Iowa DOT designers use Vissim to simulate traffic on a designed project. By simulating various design modifications, such as a lengthened turn lane, engineers can evaluate the potential effects of such modifications before a project is constructed. The Vissim software contains default values for various parameters such as driver behavior and vehicle characteristics. But Vissim is used by DOTs across the country, and actual driver behavior and vehicle characteristics can vary from state to state. If the default parameters are not adjusted for state-specific conditions, the simulations will not be accurate. What you see will not be what you get. Led by Jing Dong, transportation engineer and assistant professor of civil, construction, and environmental engineering, the CTRE study determined a process for fine-tuning, or calibrating, Vissim’s default parameter values. The goal was to reflect typical traffic characteristics at interchanges in Iowa. This will increase the accuracy of design simulations and thus engineers’ confidence in the effectiveness of their final design. Default values in Vissim to be calibrated include vehicle type and driver aggression, as measured by typical distance between moving vehicles (headway) and typical distance between stopped vehicles (standstill distance). In the study, traffic data related to vehicle type and driver aggression were collected at freeway interchanges at Ames, Cedar Rapids, Council Bluffs, Des Moines, Iowa City, the Quad Cities, and Sioux City. Data were collected using roadside sensors and existing Iowa DOT video cameras. One challenge was collecting data on standstill distance, because stop-and-go traffic is not a regular occurrence on Iowa’s freeways. The research team came up with a creative solution. First, message histories from Iowa DOT’s dynamic message signs were scanned to identify instances in which stop-and-go traffic likely occurred due to road work, a crash, or other causes. Then Iowa DOT videotapes related to the identified stop-and-go events were accessed. Data were collected from frames that captured stopped vehicles. Based on analyses of the collected data, the Vissim defaults were calibrated. Using these locally calibrated parameters, Vissim can simulate traffic conditions close to real world observations. Finally, the research team developed a step-by-step process, or implementation plan, that the Iowa DOT can use to replicate the calibration process for Vissim freeway interchange design simulations.